I would need to know more myself, but I want to know why the guy took two pills in the torso and has blood all over his face. In my view, Mr. Farias raises a rather interesting and valid legal argument. Shooting Sweat is a seizure under the 4th Amendment, and there has to be compelling reason for the government (Sgt. Cook) to effect said seizure. As for circumstances, Sweat may fall under the “special circumstances” in the use of deadly force continuum in that he is an escaped felon who likely isn’t going to easily comply with return to custody. If his accomplice was armed when found, Sweat could be considered armed as well based on the known circumstances at the time. They were traveling together and would likely share weapons if they came across them. 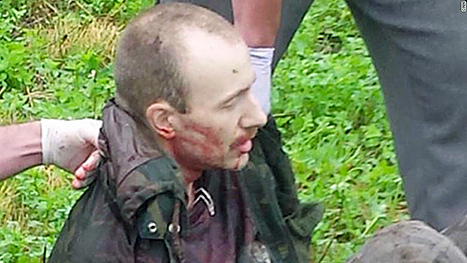 David Sweat is a convicted cop killer, so he has been known to use deadly force against officers. He has escaped from prison with another convict and tried to elude officers for an extended period of time. Legally, a good defense lawyer could argue that the means, opportunity, and intent were not there at the time of the shooting, but it’s also impossible to recreate the exact scenario to see what the vantage point was from Sgt. Cook’s point of view. If I remember correctly, past rulings on use of deadly force have pretty much done away with Monday morning quarterbacking the decisions, so it would be a coin toss as to which argument would prevail in court. It would be up to the ability of the defense attorney and prosecutor to convince a judge or jury. Based on past leeway given to officers, I don’t think Cook’s actions would be ruled unjustified. That, however, still wouldn’t necessarily make him a hero either. Once an escape is no longer in progress, but has been accomplished, that is, once the subject is no longer in the immediate environs of the facility, officers must attempt to effect a rearrest of the subject. In such cases, the policy pertaining to escaping prisoners is no longer applicable. Deadly force would then be authorized only consistent with the policy governing the use of such force in circumstances other than those of escaping prisoners. Whatever the rule, I’m not going to shed a tear over Sweat’s injuries. Armed or not, he endangered everyone in a large part of upstate New York merely by being on the loose: the situation of a large number of law enforcement personnel out in rural areas, day and night, combined with a lot of nervous civilians with firearms, left too much room for deadly accidents. I too lack enough information to say for sure that the shooting was justified, but I’m disappointed that our Governor who is, or at least at one time was, a lawyer wasn’t a bit more circumspect in his comments. Am I the only one who thinks the pictures of the police officers with Sweat look a lot like pictures of hunters showing off a deer? If he had been hit in the lung and coughed up blood, it would make sense for him to have blood on his face. At least it was Sweat. Can you imagine, (shudder the thought), if SGT Cook shot someone who merely looked like Sweat? Quite frankly that was my immediate reaction as well so I was a bit surprised that they were calling him a hero and no one was raising concerns over the shooting. Your impression of the photo is exactly the same as mine. Frankly, I find the photo disgusting. It looks staged. If it was staged, it is even more disgusting. I have no illusions about cop killers, but posing like assholes in front of the camera is beyond the pale. I wanted to smack the cops in the face who are looking up at the camera with triumphant smirks. For Christ’s sake, Sweat was not a big game trophy. You are not alone. Despite the threat Sweat represented as an escaped convict and cop killer, I do not think that this functional equivalent of the “perp walk” is appropriate. Under the Geneva Conventions, the publication or broadcasting of captured soldiers is prohibited in order to uphold simple human dignity in times of war. Perhaps the same treatment ought to be afforded captured criminals. In Gravely v. Madden, 142 F.3d 345, 348 (6th Cir. 1998), the Sixth Circuit said: “The use of excessive force to recapture an escaped convict creates a different problem than the use of force to apprehend a nonviolent fleeing felony suspect. The Fourth Amendment is not triggered anew by attempts at recapture because the convict has already been ‘seized,’ tried, convicted, and incarcerated.” The court determined that the Eighth Amendment, instead, provided the appropriate standard. So the question turned on “‘whether force was applied in a good faith effort to maintain or restore discipline or maliciously and sadistically for the very purpose of causing harm.’” Id. at 349. If that’s indeed the standard (I haven’t yet found anything more recent or from other circuits), it’s unlikely the officer violated the Eighth Amendment. I agree the pictures are disturbing. I am not sure if the shooting was justified under New York law, but I found some problems in the arguments in the post that the judge cited. According to the post, the officer saw a “suspicious” jogger, called out to the jogger. The jogger initially ignored him, but then turned around for a moment. The officer recognized Sweat and gave chase. But then, the post claims that the officer had no reason to stop Sweat to begin with, ignoring the fact that the officer recognized him when he turned around. To me, the initial encounter was perfectly valid. 1. The officer sees a jogger. Something triggers his suspicion. The officer certainly has the right to talk to anyone he wants (what is euphemistically called a “voluntary police-citizen encounter”), so he calls out to the jogger. No seizure here. 2. At some point, the jogger turns and the officer recognizes him. Now, of course, the officer has probable cause to seize him. 3. SCOTUS has held that “Where the officer has probable cause to believe that the suspect poses a threat of serious physical harm, either to the officer or to others, it is not constitutionally unreasonable to prevent escape by using deadly force. Thus, if the suspect threatens the officer with a weapon or there is probable cause to believe that he has committed a crime involving the infliction or threatened infliction of serious physical harm, deadly force may be used if necessary to prevent escape.” Tennessee v. Garner (1985). The court held that police cannot shoot any fleeing felon who is trying to escape, but it also made a point that shooting violent and dangerous fleeing felons was not unconstitutional. In this case, Sweat was convicted of killing a police officer. I would say that meets the definition of having committed a crime involving serious physical harm. He is a desperate prison escapee, with little to lose and a violent murderous past. He poses a serious danger to anyone in his path. Note that the Supreme Court did not use the word “immediate” when referring to a threat of serious physical harm. Having said that, I agree that the officer was not a hero. A hero is one who risks his / her own life to save another. This was clearly not the case here. I read the Farias piece this morning. What I thought then is what I think now. Put aside the questions of whether the shooting did or did not violate NY law and whether it violated Sweat’s 4th Amendment rights. Those are, I’m more and more convinced, questions that only lawyers qua lawyers find interesting. (I’m a lawyer, of course, but I’m trying not to write or think like one just now.) The right question about the shooting – and really about every shooting by the police – is whether it was appropriate. Cook saw someone he believed was Sweat, feared that he’d lose track of him if he made it to the woods unharmed, and so shot him. How should we feel about that? Should the presumed bad guy (and of course, Cook could have misidentified the person he saw; that sort of thing happens) have been shot when he was threatening nobody but there was a chance he’d have escaped capture for a while longer if unharmed? Is that a good reason for him to have been killed? And yes, I know he wasn’t killed. But he was shot twice. He might well have been killed. They don’t call it “deadly force” for nothing. And then there’s the other question. Is Cook, even assuming shooting Sweat was the right thing to do, a hero? He captured a bad guy. That’s a good thing, I suppose. But it’s essentially chance. He didn’t risk his life – only Sweat’s. He saw. He was suspicious. He recognized. Good for him. We want cops to see, be suspicious at appropriate times, and recognize the folks they’re trying to catch. But where’s the thing that’s special, that’s worthy of extraordinary honor? For the almost quotidian acts of a cop who happened to be in the right place at the right time to turn the cop into a “hero”? It devalues the heroic. A compelling and vivid comment. Thank you! Very interesting! If the 8th Amendment applies, rather than the 4th Amendment, we are talking about a very different ball game. I must think on this some, and, perhaps, do a little research too. Thanks very much for your interesting comment. I appreciate your engagement. I tend to agree with you that under our Constitution the officer could shoot Sweet even assuming the facts are as the author of the post stated them. As far as New York law is concerned, I have no idea. I also agree that the law enforcement officer was not a hero. 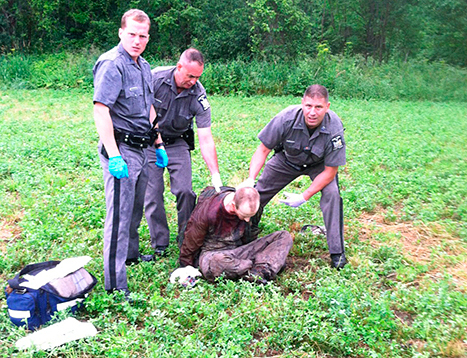 As for the photos with the law enforcement officers acting like big game hunters, they make me puke. A deer? Not so much. Body language of the cops is much more similar to poses and pictures of old black and white post shootout photos with gangsters/mafia types. But that’s just my opinion. I think under all the circumstances the shooting was justified, and the officer acted correctly. I wouldn’t call his actions “heroic” though, and the publication of the photo is very questionable. Because Sweat was an (escaped) prisoner he may not have had Fourth Amendment rights against excessive force, but, rather, only 14th and/or 8th Amendment Rights against excessive force. That would support the gut feeling that many people have that it is okay to shoot an escaped prisoner when it is not okay to shoot a suspect that poses an identical level of imminent threat of harm to the community. CF, Justice Alito’s recent dissent in Kingsley v. Hendrickson. I see someone downthread raised this same point, although I do think that courts will, in the fullness of time, primarily apply 14A rather than 8A. Remember a convicted murder has no rights – then go from there. I’ll give the cops the benefit of the doubt, as my interpretation of the photo is equivocal. It could be they are posing with a trophy, but it could also be a picture taken at an opportune moment. I have more of a problem with the person with the camera. I’ve defended many shooting cases, and a boatload of excessive force cases. It was much simpler before the Court threw a big ‘ol monkey wrench into it last week. Forget the 8th Amendment–the nuances between the definition of deliberate indifference for the 8th and 14th don’t apply because the difference is based on a physical prison or jail setting. I can’t believe I’m siding with the Civil division of the DOJ on this, and it’s going to cause excessive drinking this weekend. There would be little problem convincing a jury the shooting was good. Most folks don’t care about the broad constitutional issues, and think it perfectly okay to whack this guy. Of course, the jury would have to ignore their instructions. No ethical problem there. The problem would be that the case would be tried. Summary judgment just won’t happen. Your honor, and others, while I am not able to comment on the justification for the officer’s actions in apprehending the escapee, I must confess that my first thought when I viewed the picture post-capture was that I’ve seen this picture before…coming out of the middle east, when a particular group (with a four-letter acronym) takes a hostage. Capturing the escapee was necessary. Taking a triumphal photograph was not. We have to be better than this. We just have to be. Your comparision, which I had not thought of, is apt and, what is more, chilling. You are so right! Mr. Farias is correct, and so is SGH, for indicating that this was not a justified shooting. Not even close. As for the picture, I find it contemptible. It reminds me of the disgraced Chicago cops who posed with an African American suspect wearing antlers (published by the Chicago Sun Times 05/26/2015). One night spent in LA on patrol with my brother, LAPD Sgt, convinces me that deadly force was authorized and prudent. I was in Saigon during Tet in 1968 and less afraid than that night. I have no opinion about the photos. Who took them? Why? And who decided to release them.? Easy to be judgmental until you walk in the shoes. If the escaped killer was in my neighborhood and ran away from an officer and was still on the loose, I would be outraged. You’re leaving something out: Alleged conspirator to murder. I’m somewhat dubious the two really would have taken time from their busy escape to stop by Mitchell’s house and off her husband. But who knows. (She, on the other hand, almost certainly would be in a ditch somewhere had she not come to her senses.) In any case, that’s a pretty significant detail. As for the picture, they’re not posing him: They’re trying to keep him upright and alive.